Couldn't see any thread on this? Got in this week in the resale and never done it before. Planning on finding an air b n b for the weekend, however after some advice about how easy it is to get into Brighton on the morning? Basically is staying on the outskirts and travelling ok Or is it best to stay central. I notice the park and ride is sold out already. I'm doing it. Did the first one in 2010, so doing the tenth iteration (which will also be my tenth marathon) has a nice symmetry to it! When I did it before I stayed in the Travelodge right opposite the start but that's not so practical this time as I now have two kids in tow! This will be my third Brighton. This time I am travelling down twice from London probably on the train so I can enjoy the comfort of my own bed and avoid doing too much walking the day before. In 2013 I stayed overnight in Three Bridges and family dropping off near the start and subsequently parking at an NCP multi storey in town. Last year I again stayed at the Holiday Inn express in Three Bridges and took the train down while my family took a later train and saw me pass at three miles. That worked quite well apart from having to head to Preston Park for the mini miles. Felt sorry for the juniors as it lacked the attention being away from the sea front. Ended up doing too much walking as a result. When are people starting their training schedules? My 16-week plan starts on Christmas Eve, so ticking over until then. Trying to shake off a nagging hamstring strain before then! My 18 weeker starts 10th December, which is far sooner than I realised! Like you I've been struggling with a few niggles and having a few weeks off post autum marathon season but it seems to be having the opposite of the desired effect, plus not training is driving me stir crazy! If you mean outside Brighton and Hove, driving in is easy...but...parking is not! City centre car parks are very expensive and queues to get out afterwards are terrible! London Road car park is possibly the best bet but with road closures you have to know how to get there. On street parking is limited and expensive unless you park outside the restricted area. Otherwise, find somewhere on a train line and get the train to Brighton or from the east, London Road. HI all I have entered this first time ever. I have done London and SNowdonia, not sure what possessed me to enter another marathon tbh!! Booked air bnb a few mins walk from the start. Started a 20 week program for it this week, so this one will "Spring" up before you know it! Found this thread hard to find as it does not have marathon in the title just Brighton 2019. Can this be changed does anyone know? Im in again, same as every other year as this is my A race. Training starts for me this week following P&D schedule. > Couldn't see any thread on this? > Got in this week in the resale and never done it before. > Planning on finding an air b n b for the weekend, however after some advice about how easy it is to get into Brighton on the morning? Basically is staying on the outskirts and travelling ok Or is it best to stay central. > I notice the park and ride is sold out already. > Also who else in? I ran Brighton last year and stayed in an AirBnB in town about 15 minute walk from the start. Was very busy on the day in terms of traffic and getting out of Brighton afterwards took a while so would recommend staying as close as you can on the day. Getting a train into Brighton and then walking to start would be fine I suspect, as others have said parking space/charges are fairly difficult otherwise. How's everyone's training going? I'm in week 3 of my schedule and up to about 40mpw, so getting there. Was starting to panic about accommodation with all the hotels seemingly full, but managed to find a room in an AirBnB about a mile from the start, so that's one less worry. Must say it's incredibly annoying having to pick up your number in person rather than them just posting it. my training has come to a bit of a halt with plantar fasciitis . so a few weeks rest but had a good training base pre Christmas so should be ok.
picking up numbers is annoying but all major marathons do it. well done on getting a room. will be a great weekend. It always is. Sorry to hear about the PF - it's blighted a few of my marathons in the past but have been able to tape it up and blunder through. Weirdly when I was running was one of the only times it didn't hurt - but just walking about in between was a struggle. Plenty of golf ball/tennis ball/iced water bottle rolling! My hamstring niggles haven't eased up so seeing a physio at lunch. Hope the hammies ease up after the phsio, that's a big muscle to cause pain. What time are you aiming for at Brighton? If you can freeze a water bottle, you can roll your foot on that (fairly) discreetly! Not really chasing a specific time this year, but would be happy with under 3:20. Did the first ever Brighton Marathon in 2010 in 3:03. EE - That's not good 3 months is getting chronic really. 3:03 is a pretty awesome time. 3:20 should be a gentle trot round for you. Im probably going to end up around a similar time 3:15-3:20 but aiming for London GFA sub 3:10, I used to sneak under the 3:15 but now they have lowered it to sub 3:10. See how the training goes and the PF issue. Nine years was a long time ago! My main aim is just to complete it and enjoy it - I fell out of love with running for a few years and lost my mojo, so it's all about fun rather than obsessing over times now. Hamstring stood up to 18 miles yesterday. Hope the PF is OK! 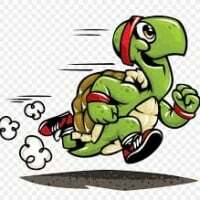 Sounds like me EE , I have stopped running a few times, not chasing PBs, as they are gone but as you get some enjoyment out of it. none of us on here are going to be winning it! Definitely better to err on the side of caution this early on. I had to stop and stretch the hammy four miles in to the previous weekend's 16. Just bringing things slowly to the boil rather than burning it! I keep saying that bringing things to the boil... however come April I will be thinking "Aghhhhh Ive left it too late"! 10 mile LT run today. Cant say I'm looking forward to it! LT being lactate threshold? How does that work then - is that marathon pace? I've just signed up for a charity place for Brighton. Will be my second time, did it in 2011 and I'm hoping it's not as hot this year as it was then. Loved the race though and am looking forward to it. Just got airb&b in central area, looks about 15 mins walk to the start. I did 3.28 in 2011, realistically hoping for sub-3.40 this time round. I'm doing 30+miles per week but am trying to not peak too early! I'll second that re: the weather - I did it in 2010 and got heatstroke! Seems to be hot at Brighton marathon most years - The weather gods always come out to play on that day! my first 20 miler of the Brighton marathon campaign this weekend. I've done a 14, 2 x 16 and an 18. Probably would have done a 20 next weekend, but doing a HM. How did it feel? How did you pace it? I've only done a 16 miler and 20, but that was off the back of some good base training end of last year. I kept pretty much to 8 min miles then last 2 miles at MP. Felt ok, so quite pleased. 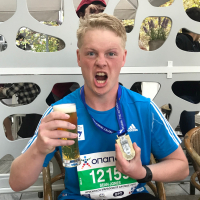 Did anyone do the Brighton half this weekend? Great weather. I didn't. Brentwood half in three weeks is my next tune-up race - did another half on 3rd Feb too. Did you do it FBT? How's your training going? Hello all. Newbie here. This is my first marathon and I must say I'm nervous as hell. Up to 18 miles but staving off a niggling hip and lower back. I have been trying the jeffing run walk method and wondered if anyone out there had used this / is using it. Thanks! I know a couple of people who've done it for Brighton and been happy with the result. I've only done it for 5k, but comfortably beat a load of people who were jogging all the way. The main thing is Do Not Set Off Too Fast!!! It's far too tempting to go off fast when everyone else goes. If you start off jeffing the 10 miles that gets the hills out of the way and then you can see if you feel up to pushing on a bit or not. You'll get left behind to start with but reeling people in later on as they start to suffer!